Left: Brown printed jumpsuit, by Ashish Soni, New Delhi. Multicoloured sandals, from Burberry, Mumbai. Metal and stone rings, from www.shoplune.com Right: Ripped denims, by Raakesh Agarvwal; printed crop top, by Hemant and Nandita; grey sandals with metal detail, from Chanel. All in New Delhi. White vest, by Sanchita, Bengaluru. The sheer scale, standard and overall level of enjoyment that Imagica offers is incomparable to any other theme park in the entire subcontinent. Printed pink leggings, by Niharika Pandey, New Delhi. Multicoloured sandals, from Burberry, Mumbai. With over 25 rides and attractions to choose from, this makes for a day easily well spent. Printed jumper with embroidered and printed cape, by Dev r Nil, Kolkata. Tan bucket bag with studs, from Tod’s, New Delhi. ‘Cataclou’ sandals, by Christian Louboutin, Mumbai. Metal rings, from www.shoplune.com Make sure you take back some souvenirs with you – Imagica gear, ‘Sugar Buzz’ candy and a special photograph for your album of memories. Cobalt blue dhoti pants, by Vivek Karunakaran, Chennai. Feathered Kolhapuris, by Niharika Pandey, New Delhi. Salmon printed silk shirt, by Sneha Arora, Kolkata. Metal and stone rings, from www.shoplune.com Whether you’re out with children, or keen to relive your own childhood, Imagica ensures a fun-filled treasure of memories to take back home. Coral tweed wide-leg trousers and grey sandals with metal detail, both from Chanel, New Delhi. Black and white embroidered top and peach embroidered silk trench, both by Nachiket Barve; sunglasses, from Prada, at Sunglass Hut. Both in Mumbai. ‘The Grand Imagica Parade’ is the star attraction of any evening, replete with toon characters, performers, magicians, jugglers and more – a sight to behold. Black and cream printed coat, by Michael Kors; embroidered crop top, by Niharika Pandey. Both in New Delhi. Ivory and black slouchy pants, by Sanchita, Bengaluru. ‘Confusina’ heels, by Christian Louboutin; red sunglasses, from Vogue Eyewear, at Sunglass Hut. Both in Mumbai. Denim dungarees, by Rajesh Pratap Singh; coral and beige sandals, from Tod’s. Both in New Delhi. Digital print shirt, by Tarun Tahiliani; ‘Diorama’ bag in black with orange flowers, from Dior; sunglasses, from Prada, at Sunglass Hut. All in Mumbai. 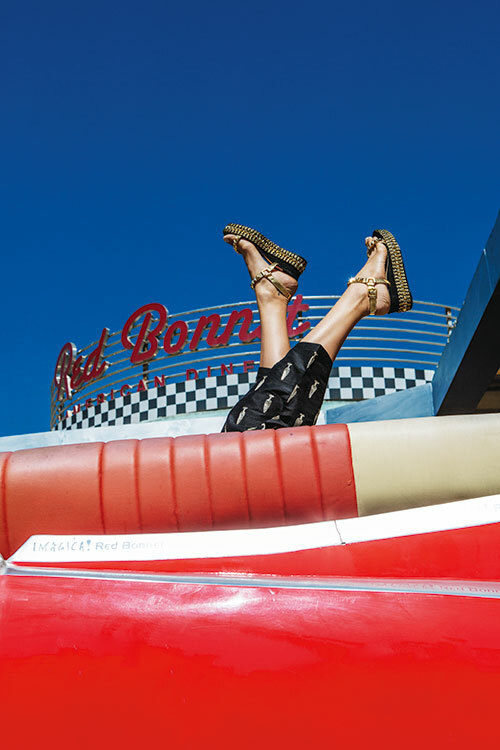 ‘The Red Bonnet American Diner’ welcomes people in droves – not only for its casual chips-n-burger cuisine but also for a great photo-op on the red vintage cars that flank either side of the restaurant. Ivory threadwork jacket, by Anamika Khanna; blue star printed palazzos, by Dev r Nil. Both in Kolkata. ‘Confusina’ heels, by Christian Louboutin, Mumbai. It’s not just key attractions like ‘Wrath of the Gods’ or ‘Haunted Castle of Salimgarh’ that have been designed right down to the last intricate detail; even the open spaces showcase iconic imagery from fairytales and folklore. Black salwar with gold appliqué, by Payal Singhal; ‘Cataclou’ sandals, by Christian Louboutin. Both in Mumbai. Imagica is many small worlds all under one giant umbrella – Viva Europa, Asiana, Arabia, Jambo Africa, India and Americana – all theme based sites where the setting, food and design match the location to create an authentic travel experience. Navy jumpsuit with pleated detail, from Chanel, New Delhi. ‘Diorama’ bag in black with orange flowers, from Dior; ‘Cataclou’ sandals, by Christian Louboutin; sunglasses, from Prada, at Sunglass Hut. All in Mumbai. ‘Nitro’, the rollercoaster ride that loops through high-speed ups and downs, could well be the biggest adrenalin rush one could experience at Imagica. Left: Ivory pants with skirted flap, by Atsu, New Delhi. Cream silk jacket with metal buttons, from Gucci, Mumbai. Metal and stone rings, from www.shoplune.com Right: Cream silk culottes, from Gucci; beige silk jacket with embroidery and black shirt, both by Payal Singhal; ‘Confusina’ heels, by Christian Louboutin. All in Mumbai. The ‘Crazy Tea Cups’ ride is immensely popular with families; with bursts of colour and a cheery outlook, it’s hard for kids to resist.